The Hickory Patio Chaise Cover from Classic Accessories is made from durable Weather10 material featuring a rugged fabric outer layer with a laminated waterproof and wipe-clean inside coating. Weather Leather trim looks authentic but wont rot. Covers chaises up to 66 L x 28 W x 29 H.
Gardelle protective fabric system offers beauty on the outside and protection on the inside. Features a fabric top with a water repellent and water resistant inside coating. Click-close straps close over the legs to secure your cover on windy days. Fits wider chaise lounges up to 78 inches long. Design the outdoors with this contemporary curvy lounger set by CorLiving. Featured in our Textured Black Weave and accented with Sultry Grey woven seat covers this versatile set is perfect for all of your of your summer poolside lounging. Made with UV resistant resin rattan wicker, water repellent cushions and a durable steel frame, this product is ready to withstand the elements of the outdoors. Transform the configuration to suit your needs. Fits Chaise Lounges up to 78"L. These covers are the "ultimate" for a reason becuase they are ideal for use in harsh weather and strong wind conditions. Duck Covers Ultimate Series patio furniture covers are designed to protect patio furniture from dust, dirt, sun, rain and heavy snow. Manufactured using a combination of high-strength polyester top panel, plus innovative, multi-layer, breathable side panels to help eliminate condensation. The multi-layer, breathable side panels eliminates the need for vents and provides additional cover height, unlike shorter competitive covers which offer less protection. High-strength polyester base for added durability. Mocha Cappuccino colour. Two-year limited warranty has you covered. Migrate to the best patio furniture covers today! This Hampton Bay cover protects outdoor furniture from dust, dirt, sun, rain and heavy snow. The heavy duty Rip-Stop fabric is durable and will protect your patio furniture for years to come. With elastic and adjustable buckles on the bottom, these quickly secure to the furniture legs, so your cover stays on during windy days. This cover fits up to 80 -inch L x 35.5 -inch W x 16 -inch H.
Hickory Patio Chaise Cover The Hickory Patio Chaise Cover from Classic Accessories is made from durable Weather10 material featuring a rugged fabric outer layer with a laminated waterproof and wipe-clean inside coating. Weather Leather trim looks authentic but wont rot. 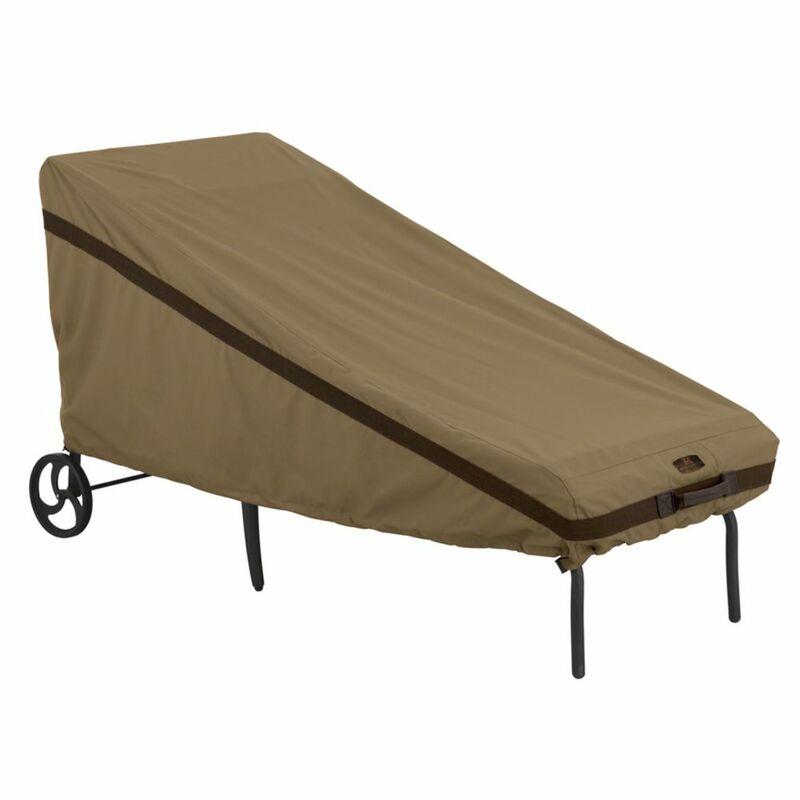 Covers chaises up to 66 L x 28 W x 29 H.
Hickory Patio Chaise Cover is rated 5.0 out of 5 by 5. Rated 5 out of 5 by Donald from I like them. Material is heavy duty and well made.... I like them. Material is heavy duty and well made. Rated 5 out of 5 by Dr Thomas from You Get What You Pay For, and Pay For What You Get In the past, we had always purchased the least expensive chaise covers and which have never stood the test of time. Most of those covers never lasted a full summer (zone 6) without fading, cracking, and/or dry rotting. Those with metal grommets typically rusted and bled onto the fabric. Those products came with either a zero to 30-day warranty and no customer service. We needed a better product. After some research, we discovered Classic Accessories. Yes, they do cost a bit more, but we grew tired of constantly trashing “other brand” chaise covers on an annual basis over the past decade. As I always say “You Get What You Pay For, and Pay For What You Get”. In this case, we would prefer to pay a bit more to enjoy a better product and better service. PROS 1. We chose the “Hickory” collection covers for our standard size chaise and have been satisfied with the heavy fabric quality, stitching, and other features. 2. The padded handles make it much easier to grab when removing. 3. The elastic hem cord and single leg snap have kept the covers on our chaise rather than occasionally blowing into our neighbors pool on windy days. 4. The fabric and colors are far more attractive compared with other lesser quality covers we purchased in the past. 5. You cannot get any better warranty than “lifetime” on materials and construction. 6. Customer service is also superior compared to most retailers. They are product knowledgeable, customer-centric, and responsive to questions and issues. CONS 1. Like any chaise cover fabric/material, sun can cause fading over time. 2. In addition, the drastic temperature change between seasons can eventually cause any fabric to break down and tear or dry rot. We did experience some fading and tearing after four years exposure to all seasons, but Classic Accessories replaced each cover without any issues. RECOMMENDATION We now only use our Classic Accessories covers Spring through Fall. Over winter, we’ll bring our Classic Accessories covers inside along with our chaise cushions. If you leave your cushions outside, cover your furniture and cushion with any weatherproof cover or heavy plastic. Rated 5 out of 5 by Denver990 from Great product Excellent product, perfect colors and accurate fit. No mess, easy installation and provides outstanding protection from severe weather elements.